The container is responsible to delete all successfully added objects. Definition at line 179 of file vm.h. Definition at line 212 of file vm.h. Definition at line 383 of file vm.cc. Definition at line 388 of file vm.cc. 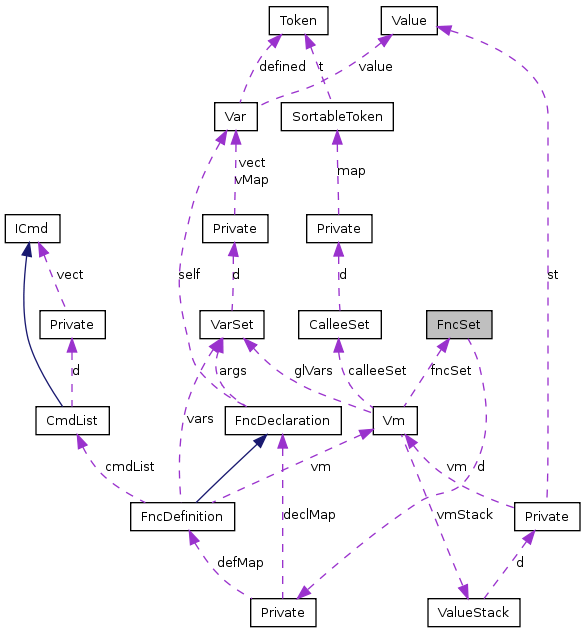 References d, FncSet::Private::declMap, and FncSet::Private::defMap. add declaration to container If declaration with the same name exists, check if not differs. Definition at line 404 of file vm.cc. References d, FncSet::Private::declMap, Var::name, and FncDeclaration::self. Referenced by Builder::fncDecl(), Builder::fncDefBody(), and FncFactory::initVm(). Return pointer to declaration if found, NULL otherwise. Definition at line 420 of file vm.cc. Referenced by VmRunner::Private::chkFncRefs(), Builder::fncCall(), Builder::fncDecl(), and Builder::fncDefBody(). add definition to container If definition with the same name already exists, return false. If declaration with the same name exists, check if not differs. Definition at line 428 of file vm.cc. References chkUnused(), d, FncSet::Private::declMap, FncSet::Private::defMap, Var::name, and FncDeclaration::self. Referenced by FncFactory::Private::addDefinition(), and Builder::fncDef(). Return pointer to definition if found, NULL otherwise. Definition at line 454 of file vm.cc. Referenced by VmRunner::Private::chkFncRefs(), CallCmd::exec(), and Builder::fncDefBody(). Definition at line 462 of file vm.cc. Definition at line 221 of file vm.h. Referenced by addDeclaration(), addDefinition(), getAllDefinitions(), getDeclaration(), getDefinition(), and ~FncSet().